Jane Yates: "I believe that the ability to wonder is our most important human capacity." I met Jane on twitter, Jane and her "Philosopher's Backpack". In her website we can read that Jane " has over 20 years of practical experience of P4C with primary school children. She is a registered SAPERE trainer and has led P4C training for over 1200 primary and secondary teachers from over 200 schools across the UK and also in Spain, Mexico City, Nepal, India, British Virgin Islands and Malawi. These include: whole school training, comissioned courses and open courses for state, private and international schools." I asked Jane to share her point of view about P4C and she answered so quickly! Thank you so much, Jane. Can you recall the first time you heard about philosophy for children (p4c)? "I heard about P4C in 1993 from a primary geography lecturer called Chris Rowley (one of the founders of P4C in the UK) at the teacher training college, Charlotte Mason College. He did a workshop at a conference that I helped to organise in response to the infamous Rio Earth Summit in 1992 through my work with Cumbria Development Education Centre, which is based at the college." And how did you started working with p4c? "Every few weeks, some of the lecturers at Charlotte Mason College, where I was working(and had trained), would hold a community of enquiry with each other using the Lipman stories as the stimulus. They kindly invited me to take part. As someone in my early 20s, I remember feeling quite daunted practising ‘philosophy’ with all these learned academics as I had come from an educational background where philosophy was certainly never an option. I was like one of those quieter children you sometimes find in P4C sessions in the classroom. I worried I would be laughed at. I worried that I didn’t have the sophisticated vocabulary to articulate my thoughts. Over time, I grew more confident to speak in this group and realised the impact it could therefore have on pupils. It was during these sessions that I learnt the nuts and bolts of reasoning and realised what a rigorous process P4C should be. I was then hugely fortunate to work with some of the lecturers at the college to try out P4C in some local schools and from there many projects developed. I was part of the catalyst for connecting P4C and Global Citizenship way back in 2010. Whatever job I’ve had, I’ve always tried to build in P4C somewhere. For the last five years, I’ve gone back to teaching and have been working with my school to achieve the P4C Gold Award (a new accreditation we have here in the UK). It was an absolute joy to achieve this in 2015. Crickey! That’s over 25 years of P4C!" Jane, that's kind of a lifetime. Congratulations! Do you think p4c is necessary to children? Why? "I think p4c is totally necessary. Young children begin their lives naturally wondering about the world. As babies, they use their hands to manipulate objects to explore and wonder about their immediate world. There’s a lot of research about the link between the brain and the hand and how important brain connections are made when toddlers are stimulated to think through object play. As children begin to develop language, there’s a shift of thinking towards speech. This wondering about the ‘world’ can extend not just to their own world, but to that beyond their own immediate experience. I believe that the ability to wonder is our most important human capacity. Just as we would not hesitate to provide a stimulating environment for babies, we must also provide stimulus for thinking as babies become children and navigate their way to becoming adults. Through thinking, children learn about the world, but they also learn about each other. It helps them develop relationships, judgements and decisions." In Portugal have a lot of activities at school and after school. There's a lot of discussion going on around this. Why should we take philosophy to schools? "Once children know what is expected from a p4c session, it can transfer to any aspect of school through curriculum lessons and life in school. Some of the best p4c that I see happens naturally in a corridor between individuals. Philosophy, ultimately, should help us to live a better life." What makes a question a philosophical question – from a p4c point of view? "There’s lots of debate over this. Most of my P4C follows the Lipman tradition by the hugely powerful experience of children developing their own questions. In this case, I would say a philosophical question generated by children needs to include, explicitly or implicitly, a clear concept or two. The way the question is framed needs to have potential to engage everyone in the community. My favourite way of describing a philosophical question is to say that it is one that we are ‘not going to settle easily’ and ‘there might be different opinions and ideas within and outside our community’ and ‘we might need to apply logic and reasoning to test out different examples within our question’." Sometimes we hear that a philosophical question has no right or wrong. What do you think about this, Jane? "It used to frustrate me that children often get into a habit of saying philosophical questions have ‘no right or wrong answers’. Arguably, the concepts of right and wrong are so huge in themselves that this notion can often reduce the complexity of a philosophical question to something rather more simplistic. And with this, there comes a tendency for relativism. However, I would suggest that sometimes children perceive ‘something’ from their unique individual experience of being part of a philosophical enquiry and jump to the conclusion there is ‘no right or wrong answers’ rather than it being something the facilitator has stated or encouraged. The binary concept of ‘no right or wrong’ is a hugely powerful one for children, especially when their experience of childhood might have very clear boundaries of what is right and wrong! For me, when this situation arises, it makes for a timely opportunity to explore the concept of right and wrong as binaries and as concepts on their own. Having said all this, some of the best enquiries have come when the questions have not been obviously philosophical. Increasingly, I am seeing the importance of involving the children in enquiry around the philosophical value of the questions themselves. I also think there is necessary value in the facilitator bringing questions that are not generated by the children through discussion plans and activities to deepen and further philosophical enquiry." What’s the biggest challenge p4c faces, nowadays? "It’s always challenging giving the time to start something new. People want quick results and P4C is not something that can change things over night. I don’t think you can do p4c half-heartedly with children, as they will know you are doing this and the rich benefits will not be as apparent." What can you say to teachers and parents about P4C, some kind of advice? Can you share a question that really surprised you? "I’m never generally surprised by any question but I’ve had many that have really made me think. Once, we had an enquiry around: “If children were in charge of school, then how would school be different?” What interested me most, was their ideas were hugely possible and powerful but called for a very different structure than our current tradition of schooling. We must never underestimate the power of children’s ideas and only see them within the narrow lenses of our own experience." 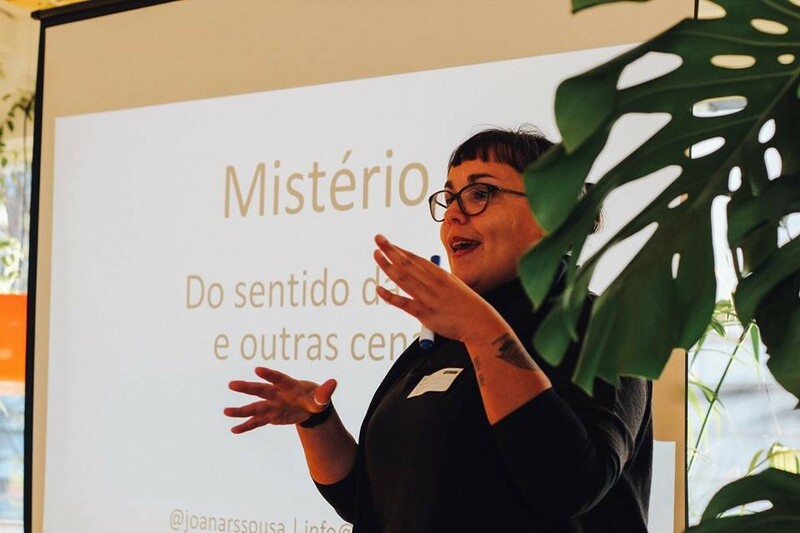 da série: "sabes que estás a fazer um bom trabalho quando"
👶🏽 joana, porque é que agora só vens cá depois do fim de semana? 🐞 como assim, não estou a perceber? 👶🏽 sim, agora temos que esperar o fim de semana e só depois é que vens cá outra vez à sala. 🐞 ahhh. querias ter filosofia mais vezes? 👶🏽 sim. podíamos ter filosofia hoje, amanhã yoga e depois filosofia no outro dia. 🐞 ah, meu querido. também gostava muito. mas quem decide essas coisas não sou eu. experimenta falar com a directora da escola para ver se ela põe filosofia mais vezes, na mesma semana. 👶🏽 joana, eu posso falar com ela, mas como ela não vem cá fazer estas aulas não sabe como é divertido. ...aparece um amigo novo na sala. e aí os amigos que já têm filosofia são convidados a explicar ao novo amigo o que é que acontece na aula de filosofia. e é nestes momentos que observamos as coisas que os marcam: umas são mais superficiais no que à filosofia diz respeito (as cartolinas com cores, por exemplo), outras já assinalam aquilo que faz com que a filosofia (para crianças) seja filosofia e vá além da conversa que visa pôr os meninos a dizer frases bonitas sobre coisas mais ou menos profundas. afinal, o que fazemos nas aulas de filosofia? - às vezes a professora faz perguntas sobre o "porquê"
agora que temos mais um amigo na sala, há que continuar a jogar e a filosofar! Steve Neumann: "(...) what we want for our children is the cultivation of judgment—for their own sake and for the sake of civil society." Once again, twitter is doing it's magic and making easy to know a little about #P4C work all over the world. Today I'm sharing Steve Neumann's view about philosophy for children. Steve is a freelance writer whose work has appeared in The New York Times, The Washington Post, The Daily Beast, and other publications. He is the 2016 Graduate Education Fellow at Moravian College studying Philosophy for Children. You can visit Steve at his website. Steve, thank you so much for your time. I start asking if you can tell us abou the first time you heard about philosophy for children (p4c)? "The first time I had heard of p4c was when I was doing research for an article I wrote for The New York Times’ philosophy blog, The Stone, titled “Free the Philosophical Beast.” At the time, I was interested in what kind of work philosophers were doing outside of the academy, and I had the good fortune to interview Grace Robinson of Thinking Space. She told me of her philosophical work with schoolchildren and connected me to numerous resources about p4c. I was hooked from then on! Here's a link to my article “The Case for Philosophy in K-12 Classrooms” that was published in the magazine STIR, to the heads of the education department at numerous colleges and universities with the desire to be invited to give a talk to their students about p4c. The head of the education department at my alma mater loved the concept, and subsequently offered me a fellowship to get my Master of Arts in Teaching in order to study p4c. I will be finished in May of 2018, and I currently have several ideas for p4c-related projects in the works." Steve doesn's think that p4c is necessary, he thinks it's essential: "As the American pragmatist philosopher John Dewey wrote in Democracy and Education, “There is not adequate theoretical recognition that all which the school can or need do for pupils, so far as their minds are concerned...is to develop their ability to think.” What are the effects of p4c on our students? "In my research so far, I can see how p4c can prepare ​students for life, work, and citizenship by utilizing a democratic community of ​teacher-guided inquiry to create a culture of thinking in the classroom. A properly executed p4c pedagogy creates an apprenticeship in both critical thinking and democracy that's based on a strong foundation of ​subject matter ​knowledge, while at the same time being able to balance the ​national need for a skilled and educated workforce with the individual desire for ​self-realization. I believe it can be a vital component in one’s ability to pursue Aristotle’s conception of eudaimonia. Philosophy, as the love of wisdom, is ideal for education because, in addition to the accumulation of knowledge, what we want for our children is the cultivation of judgment—for their own sake and for the sake of civil society." In Portugal, children have a lot of activities at school and after school. Why should we take philosophy to schools? "We have the same state of affairs here in America. Not only are children overwhelmed with activities during and after school, but our teachers feel over-burdened with the persistent rollout of new standards and curricula every year. But give my answer to your previous question, I feel that creating a culture of thinking through a p4c-inspired pedagogy is essential, and therefore we should do what we can to encourage teachers and school administrators to reflect on their values and re-structure their time and programs accordingly." What makes a question a philosophical question – from a p4c point of view? "To me, what makes a question a philosophical one is the quality of reflection, of thinking, that it stimulates. I think the essence of philosophy is about gaining clarity about our ideas, defining terms, drawing distinctions—generally being able to fully understand a concept or idea, that we can recognize it in any context, and how one idea or concept connects to another, etc. What makes a question philosophical is what you do with the question, not so much the question in and of itself." Thank you again, Steve. See you on twitter! Laura D'Olimpio: "I think adults can also gain a great deal by pausing to reflect on the “why?” questions children ask"
I met Laura on twitter - YES! social media bringing people from all over the world togheter! Laura is Senior Lecturer in Philosophy, at The University of Notre Dame Australia. She is also Co-editor Journal of Philosophy in Schools - if you don't know what it is, please check it out here. Laura, thank you so much for giving me some of your time answering my questions. Do you recall the first time you heard about philosophy for children (p4c)? "When I started my PhD in Philosophy, I was working as a research assistant for a drama educator who ran drama and literacy workshops for gifted and talented children from ages 3 – 18. It was through this work that I discovered philosophy for children in 2004. I started using narrative, music and drama as vehicles to encourage children’s questions and exploration of ideas. I was amazed at the philosophical questions and discussions that resulted from this work and published my first article “Drama and Philosophy: Language, Thinking and Laughing Out Loud!” in the International Drama Educators Association (IDEA)/Applied Theatre Researcher Journal as a result. I still love the connection between aesthetic education and philosophy in schools." How did you start working with p4c? "I was working on my PhD Thesis in Philosophy at UWA when I encountered P4C. My Thesis, The Moral Possibilities of Mass Art, explored how narrative art, and film in particular, could be used as a tool for moral education and encourage critical thinking in viewers. I eventually decided that what was needed was to train viewers to be critically engaged from a young age. Therefore, by my last chapter, I was recommending P4C as an ideal method by which to achieve this goal." Do you think p4c is necessary for children? Why? "I believe that children are natural philosophers in the sense that they are inquisitive and love learning about life and the world around them. I think it is important to encourage children’s “why?” questions, and take them seriously. I think adults can also gain a great deal by pausing to reflect on the “why?” questions children ask, and taking the time to engage in a dialogue in which we are all inquirers seeking truth and wisdom. I think this can be done playfully, without losing the sense of importance such questions and their answers naturally convey. What I love about P4C is that it consciously does all of these things, and makes room in educational spaces for such philosophical reflection, wondering, dialogue and the exploration of ideas for their own sake. This is sorely needed in a time where a lot of education is aimed at test results and measurable outcomes." I don't know about Australia, but nowadays, in Portugal children have a lot of activities at school and after school. Why should we take philosophy to schools? "Philosophy is valuable because it trains the thinking skills everyone needs in life. Studying philosophy involves explicitly learning how to formulate, defend, justify, analyse and critique arguments. Philosophy focusses on conceptual and normative questions that are central to how humans make meaning and justify what they value in life. It also allows for critical reflection on the history of ideas that have led us to where we are now. The study of philosophy is valuable in and of itself. Another way to argue that busy teachers should include it in their curriculum is by pointing to the measurable benefits P4C offers students. There have been empirical studies done (by Trickey & Topping in the UK, by Buranda State School in Queensland, Australia, and more recently by the Education Endowment Foundation in the UK), that demonstrate that students who study one hour per week of philosophy in the classroom have improved literacy, numeracy and problem-solving skills, plus there are reports of better behaviour as well. These results are not surprising because the study of philosophy trains general thinking skills. Furthermore, the community of inquiry pedagogy promoted by advocates of P4C encourages respectful dialogue and empathetic engagement with others whose ideas may differ from one’s own. P4C therefore promotes the practice of good habits, and also improves overall test results, while not being costly to implement in the classroom. Given this is the case, the real question is why aren’t more schools offering philosophy as a compulsory subject to all students?! Let's talk about questions: can you help us understand what is a philosophical question? "There is some debate about what makes a question philosophical, both within the P4C tradition, and in the field of Philosophy. A question is philosophical if it is open, ‘deep’, and doesn’t yield an immediately obvious answer. A philosophical question invites contemplation, wonder, and will generate multiple answers. The job of philosophers or inquirers is to investigate these answers in order to determine which is the best and most reasonable. And by ‘best’, I mean that the argument is justified and logically constructed, that its premises are sound, and assumptions valid. The conclusion or ‘answer’ that follows will also stand the test of time and take its place among the history of ideas. This is why the classic philosophical questions are eternally relevant to human beings’ quest for a meaningful life. Can you give the teachers and the parents some kid of advice to help them deal with the children’s questions? "It’s OK to say ‘Good question! I don’t know the answer to that either. Let’s think about it together’! Genuine inquiry starts with puzzlement and wonder and moves forward from there. Don’t be in a rush to get to the end of the inquiry – I think about the process of philosophical inquiry as a lifelong journey! We can revisit the same questions countless times and we keep exploring and uncovering new ideas, building upon or revising and refining ideas from previous inquiry sessions, and that’s a good thing. A really good tip for teachers is to always do a final reflection – for the participants in the inquiry as well as for yourself. Give everyone the chance for a ‘last word’ (which they can ‘pass’ on if they like), and give yourself 5 - 10 minutes to reflect on what worked, what you’d like to improve upon, and moments that surprised you." Laura works mostly with university students and she takes many P4C games and activities to her classroom: "Children, and adults surprise me all the time with their questions and ideas! That’s why I love teaching philosophy." Laura knows that P4C faces many challenges: "P4C has to be inclusive and encouraging of variations on theory and practice in order to allow for growth and expansion if they wish to remain relevant and innovative. I don’t think P4C can afford to be too strictly tied to the ‘purist’ Lipman model if it is going to continue to attract increasing numbers of supporters who are both academics / researchers as well as practitioners, but at the same time, we should also preserve those classical origins of the movement. P4C also needs to continue to establish and maintain positive research ties to those working in Philosophy of Education, and Philosophy more generally. An inclusive and expansive approach will ensure P4C or ‘philosophy in schools’ continues to grow and be well respected in academic circles as well as within educational spaces." ainda há alguns dias falei que haveria um passatempo #filopenpal, aqui neste cantinho. pois cá vai ele! 1. escrever uma pergunta começada por "porque é que..."
podem participar crianças, jovens, crescidos: o desafio está aberto a todas as idades. a única condição é pensar numa pergunta e ilustrá-la de alguma forma. - a criatividade da ilustração. o passatempo começa... AGORA! e dura até ao dia 15 de Dezembro (23h). o livro Porquê (Tracey Corderoy, Tim Warnes, da editora minutos de leitura) fala-nos de um rinoceronte chamado Rodrigo e que fazia muitas perguntas, a todo o momento. ele queria saber muitas, muitas coisas. nas últimas semanas levei este livro para duas turmas do 1º ano. depois da leitura do livro desafiei-os a fazer como o Rodrigo e a pensar em perguntas começadas pelo "porque..."
* alguém disse, de repente: por que não têm asas! * os pais, tios, avós, irmãos mais velhos... também se podem juntar a nós! Tomas Miranda Alonso: "Las preguntas de los niños nos cuestionan a nosotros mismos, nos tienen que ayudar a pensar." Tomas Miranda Alonso vive aqui mesmo ao lado, em Espanha. Conheci-o numa das aulas da Pós-Graduação que fiz na Universidade dos Açores (UAc). Em Outubro de 2016 tive o prazer de o conhecer num encontro organizado pelo NICA (UAc). Desafiei o professor Tomas no facebook, para responder a estas perguntas. O sim foi imediato. É um privilégio estudar numa altura em que as pessoas que citamos em artigos estão à distância de um e-mail, de um tweet ou de uma mensagem privada numa qualquer rede social. ¿Te acuerdas cuando fue la primera vez que oiste hablar de filosofia para niños? " Sí, perfectamente. Fue en un artículo de Félix García Moriyón publicado en Revista de Filosofía y Didáctica de la Filosofía en 1987 con el título: «La filosofía para niños, una propuesta sólida y coherente». En este artículo descubrí que existía un proyecto educativo que surgía de preguntas semejantes a las que yo me hacía en mi práctica docente y que ofrecía una metodología, unos materiales y unos procedimientos adecuados para convertir el aula en una comunidad de indagación filosófica." ¿Como has empezado a trabajar en area? En el verano de 1988 asistí al primer Seminario de Formación de Formadores de FpN que se celebró en España, el cual lo dirigió Anne Sharp, ayudada por Félix. Aquel grupo inicial de profesores que acudimos al curso, casi todos de la especialidad de Filosofía, asumimos la tarea de aplicar FpN en nuestras clases y de formar a otros profesores. En mi caso, empecé aquel curso 1988-89 a aplicar FpN en mis clases de Ética en el instituto de bachillerato en el que estaba destinado y a realizar cursos de formación para el profesorado. Desde entonces he aplicado la metodología de la comunidad de investigación en mis clases, tanto en el instituto como en la universidad, sigo trabajando en la formación de profesores, he participado en trabajos de investigación y de creación de materiales curriculares, etc." ¿Consideras que la fpc és necessaria para los niños? E porquê? " Yo no diría que se trate de una condición necesaria, pues hay niños que no han acudido a sesiones de FpN y no por ello podemos decir que no se han desarrollado adecuadamente. Sí pienso que el desarrollo de la capacidad de pensar exige cuidar y potenciar la capacidad y la necesidad que tienen todos los niños de hacerse preguntas filosóficas y de pensar filosóficamente. Sí es necesario crear las condiciones educativas adecuadas para que el niño pueda pensar crítica y creativamente." Hoy en dia los niños em Portugal tienen muchissimas actividades en la escuela e fuera de ella. ¿Porquê debemos tener la filosofia en las escuelas? "Porque los niños se hacen preguntas filosóficas, porque precisamente es en la niñez cuando surgen las preguntas filosóficas más profundas, porque los niños disponen de la capacidad de asombro ante lo que les rodea y necesitan buscar sentido a lo que hacen. Porque los niños no solo piensan, sino que también piensan sobre el pensar. Porque los niños disfrutan dialogando y pensando sobre cuestiones filosóficas. Porque necesitan y les encanta ejercitarse en el juego del pensar. Pero ¡ojo!, la mera presencia de la filosofía en el currículo educativo no asegura que los estudiantes vayan a ser más críticos. No se trata de que los niños memoricen las respuestas que los filósofos han dado a las preguntas que ellos se plantean, o las que da su profesor o un libro de texto, sino de que dialoguen entre ellos buscando las mejores razones para apoyar sus puntos de vista, siempre dispuestos a modificarlos teniendo en cuenta los puntos de vista de los demás." ¿Que és lo que hace que una pregunta sea una pregunta filosófica - desde el punto de vIsta de la fpc? Más que definir en qué consiste una pregunta filosófica, voy a dar algunas características que comparten éstas, las cuales, como los miembros de una misma familia, tienen en común algunos rasgos, pero no todos. Por ello, podemos decir que las preguntas filosóficas comparten un aire de familia. Algunos de esos rasgos son: son preguntas importantes para todos los seres humanos, tienen que ver con el sentido de la experiencia humana, sus respuestas no se pueden encontrar en las ciencias ni en una enciclopedia, nadie las puede responder por ti, son preguntas abiertas, es decir, pueden tener más de una respuesta, tienen un carácter abstracto. Podríamos decir que las preguntas filosóficas se relacionan con las grandes ideas que nos mueven a los humanos: el ser, la verdad, la bondad y la belleza." ¿Cuáles son los mayores desafios que se enfrenta hoy en dia fpc? En primer lugar, pienso que hay que cuidar mucho la formación del profesorado que trabaja en FpN. Los profesores han de tener interiorizado un modelo de educación cuyo objetivo no consiste tanto en adaptar a los estudiantes a la sociedad en que viven, ni en trasmitirles una conjunto de conocimientos, sino en ayudarles a que desarrollen las habilidades que les permitan pensar por sí mismos y decidir que personas quieren ser y en qué mundo quieren vivir, para ir construyéndose y construyéndolo en procesos cooperativos. Los facilitadores de los diálogos filosóficos han de ser capaces de mantener y de animar el diálogo filosófico y, para ello, han de tener como supuestos necesarios las virtudes que hacen posible el diálogo: capacidad de escucha, conciencia de su falibilidad, respeto al otro como persona, humildad intelectual, etc. En segundo lugar, FpN se está aplicando actualmente en diversas circunstancias y espacios, y se está adaptando a diferentes contextos y situaciones. FpN ha salido fuera del aula y ha recibido influencia de otras corrientes filosóficas y pedagógicas que pueden ser enriquecedoras. Es importante, pienso, que este crecimiento sea coherente con los planteamientos teóricos y metodológicos que caracterizarían de un modo abierto y procesual las señas de identidad de FpN." ¿Puede dar algunos consejos a maestros y padres para ayudarles a lidar com las perguntas de los niños? Los maestros y los padres han de tener en cuenta que los niños no son objetos de una educación que tienen ellos que dar. Los niños deben ser sujetos activos de su propio aprendizaje. La misión de los educadores consiste en ayudarles en esos procesos de enseñanza-aprendizaje. Son los niños los que se hacen las grandes preguntas filosóficas, pero los mayores no debemos caer en la tentación de darles las respuestas, nuestra función es ayudarles, por medio del diálogo, a que sean ellos los que vayan respondiéndose a sí mismos. Las preguntas de los niños nos cuestionan a nosotros mismos, nos tienen que ayudar a pensar. Los que convivimos con niños tenemos la gran suerte de poder aprender a pensar con ellos. Niños y adultos nos educamos mutuamente." ¿Alguna vez has sido sorprendido con una pergunta de un niño? Puedes compartir con nosotros la pregunta? " Son muchas las veces que me he sorprendido por preguntas de niños. Recuerdo una ocasión en la que un sobrino mío, de nueve años, me llamó por teléfono a las once de la noche diciéndome que tenía que hacerme una pregunta. Yo pensé que se trataría de una cuestión de alguna materia escolar, que tendría una respuesta cerrada. Sin embargo, la pregunta fue: “tío, ¿qué es la eternidad y qué es el infinito?” Evidentemente yo no podía dar una respuesta a esa pregunta que no fuera la mera definición del diccionario, pero no era esto lo que mi sobrino demandaba. Decir que “infinito” es lo que no tiene fin no es la respuesta a la pregunta, aunque a lo mejor conseguía con ella callar al niño en aquel momento. Aquella era una buena ocasión para establecer un diálogo con él para intentar entre los dos aclarar el significado y la referencia de esas palabras, aunque, quizás, no era la hora apropiada. Recuerdo también otra anécdota graciosa y muy interesante. Estaba pidiendo a una niña de ocho años razones de algo que había dicho, y su respuesta era “porque sí”. Después de repetirme cuatro veces que “porque sí”, se para, se queda un poco pensando y me dice: «ya sé que “porque sí” no es una buena razón, pero lo dice mi madre». Interesante, ¿no? A los niños y adolescentes que me rodean y me han rodeado tanto en mi familia como en el ejercicio de mi profesión les agradezco todo lo que me han aportado en la construcción de la persona que soy." Jorge Sánchez-Manjavacas Mellado: "el trabajo que se desarrolla en las sesiones de FpN es una propedéutica para otras materias que presentan sus primeros retos como la literatura o las matemáticas." Conheci o Jorge Sánchez-Manjavacas Mellado através das redes sociais. Temos um amigo em comum, o Jose Barrientos Rastrojo (o orientador da tese do meu primeiro mestrado). Além disso, temos algo mais que nos une: a filosofia para crianças / filosofia para niños. Acompanho o trabalho do Jorge à distância e não podia deixar de lhe enviar estas perguntas, pensadas em português e traduzidas com a ajuda de uma pessoa amiga, no twitter. As perguntas e respostas foram trocadas via e-mail e são partilhadas com todos vós, na língua dos "nuestros hermanos". O Jorge faz parte da minha lista de pessoas com quem gostaria de trabalhar um dia. ¿Te acuerdas cuando fue la primera vez que oiste hablar de filosofia para niños? "Pues mi acercamiento al mundo de la Filosofía Aplicada fue por parte de mi profesor de Filosofía en Secundaria. Mi relación con él ha estado muy presente desde que dejé el instituto y él me hablaba, entorno al 2003 sobre diferentes herramientas en las cuales la Filosofía tiene aún mucho que decir. Posteriormente, en 2011, lo escuché como teoría y práctica en un curso con Oscar Brenifier y a partir de ahí empecé a indagar por mi cuenta quienes era Lipman, Sharp, Moriyón, etc." ¿Como has empezado a trabajar en área? "Empecé en 2012 en una biblioteca en la que llevaba realizando un Café Filosófico desde el año anterior. Allí me dieron la oportunidad de trabajar 6 meses con niños y 6 meses con adolescentes. Lo cierto es que las oportunidades que me han dado en las bibliotecas han sido clave para que yo pudiera desarrollar mi labor y seguir aprendiendo mediante una práctica de lo que quería hacer." ¿Consideras que la fpc és necessaria para los niños? E porquê? "No solo es necesaria, además desempeña un papel fundamental en la adquisición de destrezas, habilidades y competencia de los niños. En muchos casos, el trabajo que se desarrolla en las sesiones de FpN es una propedéutica para otras materias que presentan sus primeros retos como la literatura o las matemáticas." Hoy en dia los niños em Portugal tienen muchisimas actividades en la escuela e fuera de ella. ¿Porquê debemos tener la filosofia en las escuelas? "Eso es justamente lo que ocurre actualmente con mis talleres. Los niños tienen deportes, inglés o música y acaban por no darle una oportunidad de la Filosofía para Niños porque se quedan sin tiempo para algo tan positivo como es jugar. Esto me entristece mucho porque no le están dando importancia a la calidad del pensamientos o del diálogo de los más pequeños y queremos que hablen muchos idiomas y sean muy inteligentes, pero no saben de qué temas hablar o con qué calidad en las argumentaciones, ni si quiera se preocupan por saber si sus actuaciones están dentro de la moralidad o es una simple repetición de acciones de que otros hacen. Aunque para llevar esto a la escuela es otro reto. En las escuelas e institutos españoles se elige entre una asignatura enfocada al desarrollo de habilidades éticas y morales o la moral religiosa católica (muy pocos colegios ofrecen una religión que no sea la "mayoritaria"). De esa manera se crea una competencia muy compleja entre alumnos que saben que recibirán una alta calificación si sigue una moral religiosa o alumnos que tienen que trabajar duro y esforzarse para tener una buena nota. Yo considero que la creencia religiosa debería dejarse en el plano extracurricular, debemos ofrecer a los alumnos que en los colegios se de esa convivencia y tolerancia que existen en las comunidades de indagación o investigación y que fuera de las enseñanzas formales cada uno elija al dios que quiere rezar o en el mito que quiere creer." ¿Que es lo que hace que una pregunta sea una pregunta filosófica - desde el punto de vista de la fpc? Una pregunta propiamente filosófica es aquella que plantea un reto; sea un problema dilemático o plantee resorte que despierte su curiosidad por averiguar qué hay detrás, en el fondo de la cuestión. Casi cualquier elemento de la realidad, al analizarlo de una manera detenida, muestra las aristas y la complejidad de su propia existencia. Solo las preguntas que son retóricas y que buscan una respuesta preestablecida son las únicas que se alejan del potencial de la pregunta filosófica. También habría que preguntarnos en este asunto un elemento importante: ¿Puede influir la formulación de una pregunta para que adquiera el cariz filosófico o no? ¿Cuáles son los mayores desafíos que se enfrenta hoy en dia fpc? "Creo que el mundo de la Filosofía en la infancia se enfrenta a múltiples desafíos: por un lado considero que existen múltiples formas de aplicar un programa, el de Lipman, que hoy tiene múltiples caras y múltiples visiones. Existe la Filosofía con Niños, Filosofía desde la Infancia, Filosofía visual para Niños, Filosofía para Niños en contextos de marginalidad y de exclusión social, Filosofía para las Familias, etc. Creo que lo interesante es todo lo que se puede aportar a día de hoy que nadie excluya al otro considerando que solo existe un único programa o una única de usar los programas y metodologías. Creo que aportar podemos aportar todos, excluir, no debemos excluir a nadie." ¿Puede dar algunos consejos a maestros y padres para ayudarles a lidiar com las perguntas de los niños? En mis sesiones con padres siempre les hablo del "Diálogo democrático" y se lo ofrezco como un espacio para hacer en casa con los niños y las niñas que quieran tener durante un rato a la semana o al día ese espacio en el que los niños tienen algo que decir y pueden hacerlo. Además de proponer cosas en el funcionamiento de la familia, etc. Cuando les damos voz y oímos sus exigencias, en algunas ocasiones se da eso tan interesante como que la educación es democrática y no la convencional de corte más dictatorial o dogmático ("¡Te lo comes porque yo lo digo!")" ¿Alguna vez has sido sorprendido con una pregunta de un niño? Puedes compartir con nosotros la pregunta? "Creo que las que más me han llegado a sorprender son las que tienen que ver con comer animales y la crueldad, con la sensibilidad que pueden tener los niños sobre el maltrato a animales, mujeres o niños. Temas que ni se tratan en casa en profundidad, excepto mediante las noticias y de manera más descriptiva que reflexiva. "¿Pueden los humanos pegar a otros humanos y seguir siendo humanos?" "¿Es miedo lo que siente un hombre que pega a una mujer?" "¿Alguna vez alguien ha pensado como piensa un cerdo al que nos vamos a comer?"